I have a habit of reading while I am in potty. I am sure many you do this as well. More often it will be a newspaper or a magazine and rarely a book. Even if it is a book we can’t really finish more than a couple of pages while sitting there. But I found “The Poop book!” is an appropriate book to read while you are in the loo. Not because it is about poop (of other animals) but also one can finish the whole book if one strained oneself to read for few extra minutes when sitting and doing one’s job. This book explains how animals use poop and their special way of pooping. Although it is written and illustrated for kids it is also meant for adults. Each page has piles of information about animal poop. To start with we can learn different names for poops for different animals. 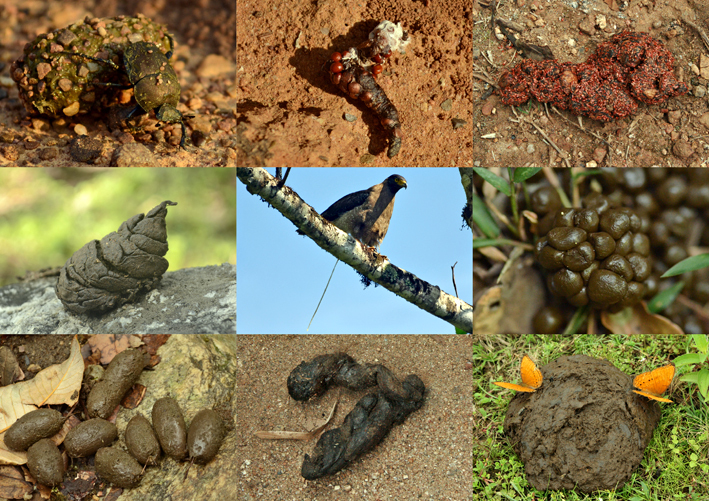 Sometime back few of us started a directory of animal poop in Indian languages and were quite amazed to find a diversity of words we have for various animal poops. This book will make you start thinking about this aspect in your language. Do list out what you know or find as you go along and you will be surprised. 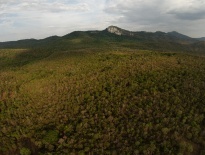 Long time ago while passing by a rock-bee colony, I found that the surface below the hives was covered with yellow dots. As I approached right below the hive, I felt a very light drizzle of yellow shower on me. It was interesting but I didn’t give it much thought back then. But after reading this book I realized that the yellow rain I felt that day was actually the shower of honeybees poop! Not just that, lions roll in herbivores poop to mask their smell from their prey before hunting, sloths climb down the tree to poop, pitcher plant is a tree shrew toilet, and there are creatures that mimic poop to escape from the predators; these are some of the fascinating things one can learn from this book. There is no jargon used and pages are not text heavy. Apart from the interesting illustrations each page has a pair of comical kids joking about the facts mentioned about animal poop which in many cases largely reflect what a reader would think. 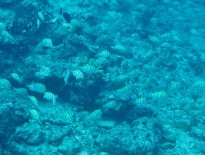 The authors have licensed this work under Creative Commons (CC BY-NC-ND 4.0) which his commendable. There were a couple things I was unable to digest about this book. Firstly, the information on making paper out of elephant and rhino poop which mentioned in the book felt incomplete. Readers (both young and grown-ups) should not get an idea that dung can be collected from the natural habitat and used for making papers. Dung and its decomposers in the forest are important for nutrient cycling and this process is critical for healthy ecosystems. I wish the authors could mention this information somewhere in the book. I was also looking forward to to reading about Black-naped hare, which was absent. This could have been a good example to explain poop eating behavior (coprophagy) in some animals along with aphids and ants (which is given in the book). Authors have often not mentioned specific names of animals while explaining things. This is fine since the book is largely meant for young readers. However, it would be useful to give details at least in some cases. For instance, which species of tree shrew uses the pitcher plant as a toilet. Normally when I buy a new book I like to open and smell it. I did the same while reading this book and it smelled nice despite the bad odor around me. I can write few more good things about this book but I better stop it here since I want you to finish reading this before you are out of the loo! The Poop book! 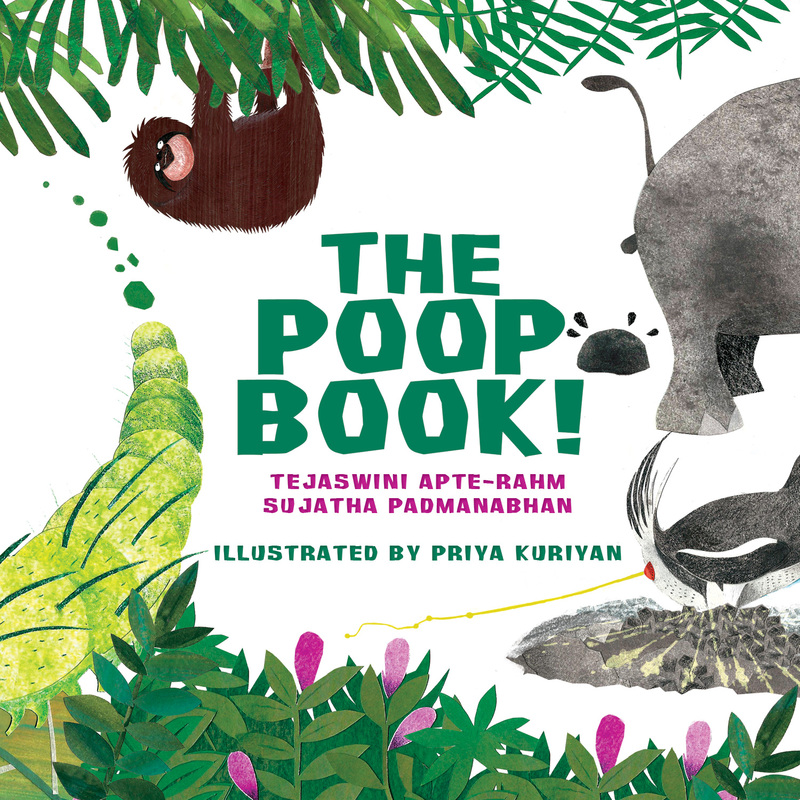 is written by Tejaswini Apte-Rahm and Sujatha Padmanabhan, illustrated by Priya Kuriyan and published by Kalpavriksh. Pp: 1-24. Price: 100 INR. Book review published in SAEVUS Magazine. December 2018. Pp 24-25.